Many current storerooms are not designed to address the needs of the maintenance efforts they are intended to support. Regardless of the organization’s size, most storerooms are operating as they did when the plant first opened. These storerooms still have the light duty metal shelving that wastes much of the vertical storage space, and heavy-duty pallet racking with extra wide aisles for larger and heavier components which require more space. For many organizations, changes to make their Maintenance, Repair and Operational (MRO) maintenance storerooms more efficient are long overdue. Here are some recommendations for bringing your operation up to date, from location and layout to work processes and technology. The MRO storeroom is expected to stock and provide the parts Maintenance needs to maintain the operating equipment. The culture of the maintenance organization directly affects how the storeroom will function. If the expectation is to provide repair parts quickly for equipment breakdowns the storeroom will be forced to operate with a large inventory investment and in a very reactive mode. If maintenance is conducting Reliability Centered Maintenance (RCM) and planning and scheduling their work, the storeroom operates in a more efficient and proactive manner with less inventory. How the storeroom manages parts held in inventory affects the outcome of equipment reliability. A harsh storeroom environment can damage parts. Dust, dirt, heat, cold, vibration and static electricity can impact the quality and performance of some parts when they are put in service. Their service life can also be affected by how parts are physically handled and stored. Consider the impact of an electric motor dropped while being moved or the motor shaft struck by a lift truck. Mishandling parts can cause concealed damage to the part that will affect the service life of the component or cause collateral damage to other equipment when installed. Past thinking was that the storeroom needed to be centrally located so the maintenance techs had easy access from anywhere on the site. This philosophy was driven by the role of the storeroom and the need of the employees to have access to everything from office supplies and consumables to repair parts for performing equipment maintenance. Current thinking is that the storeroom should be located on the perimeter of the site for increased security. Placing the storeroom on the site’s perimeter also reduces delivery traffic that can cause a safety hazard for employees and operators of the delivery vehicles. Locating the storeroom on the site’s perimeter increases the need to plan and schedule the preventive and routine maintenance work. To support the planning and scheduling of this work, the parts would need to be kitted and delivered to a staging area or specific job site. Ensuring the needed parts and services are available before the job is scheduled is critical and directly supports a proactive maintenance and storeroom operation. Regardless of the storeroom’s location, how space is utilized determines whether the storeroom operates efficiently. Assessing the vertical space as well as the square footage defines the storage equipment that will be best suited to manage the parts effectively. Most MRO inventories contain about 70% small items and the balance of the inventory is larger components and sub-assemblies. The smaller items in the storeroom inventory should be stored in high density cabinets (Figure 1) where the utilization of space is drastically increased over metal shelving. In my experience, I have been able to reduce the footprint of metal shelving in a storeroom by two-thirds by implementing high-density storage cabinets. Using high-density cabinets also provides protection from environmental hazards such as dirt and contaminates that can damage parts. If square footage space is limited but there is ample vertical space, vertical carousel units (Figure 2) are an option. 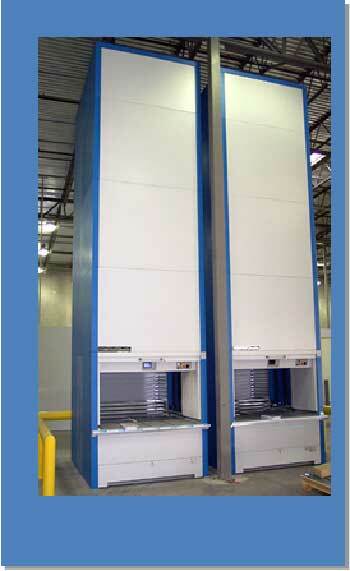 These units combine the high-density storage capability with a small footprint to store large numbers of parts. These units are not limited to storage of small items. Most of the vertical carousel units have a maximum weight capacity of 300 - 400 pounds per tray. These units can be configured in varying heights from 16 feet to over 30 feet tall to make maximum use of the available vertical space. Implementing vertical carousel units significantly increases the utilization of available square footage and reduces the required footprint even more than high-density cabinets. A limiting factor with vertical storage units is usually the cost, which can range from $150,000 to $250,000 per unit. Technological advancements in inventory management can be a valuable tool to manage the repair parts inventory if the software is implemented and managed properly. Many organizations have invested hundreds of thousands of dollars to purchase and install a state-of-the-art inventory management system but do not fully utilize the capabilities of this technology to manage their inventory. Unfortunately employees often don’t receive ample initial and follow-up training on how to use the software. Without sufficient training the employees will rely on spreadsheets and other work-arounds to get their work done. The business software is one of the most critical parts of managing the storeroom. Bar code technology, which is supported by most of the software applications available today, has been around for decades yet only a few storerooms have fully implemented this technology to track and manage their MRO inventory effectively. To maintain visibility of the storeroom inventory, the receipt, management, usage and re-stocking of the inventory has to be streamlined and updated in real time. If this software is managed properly then everyone has access to real-time inventory reporting. Accurate, real-time inventory visibility is essential to the maintenance planners. If they are not confident that the inventory is accurate they will spend much of their time doing physical checks of the inventory to ensure the parts are actually there. The storeroom should be laid out with consideration for utilization of space and material flow within the storeroom. Analysis and classification of the inventory using the A-B-C identification system enables the storeroom manager to establish a cycle-count frequency and define what is a critical item, what should be held in the inventory as a stock item, items that should be non-stock (order on demand), or commodities that should be vendor managed in the shops. Repetitive handling or moving the inventory multiple times is a waste of effort for the storeroom staff and increases the chance of damaging the item. When determining the space needed for a specific commodity group a cushion of 15% of the space should be reserved for expansion. This approach provides space for new parts stocked for equipment modifications or new equipment installations. Generally, inventory is best located and managed using commodity grouping of the items. The main advantage of grouping the inventory by commodities is that you can decrease the occurrence of duplicate inventory. Reducing duplicate items decreases the dollars invested in inventory and frees up valuable space. If the storeroom is not staffed 24/7, having the inventory grouped by commodity helps the off-shift maintenance supervisors and techs find the part they are looking for without searching throughout the storeroom. Using high-density cabinets or vertical carousel units increases the utilization of available space. But if the system used to slot (locate) items isn’t accurately maintained in the inventory management system it will be very difficult to find the item when requested. Therefore it is important that items are located correctly during the stocking process and that any location moves or errors discovered during cycle counts are immediately corrected in the inventory management system. Order lead-time: The understanding of order lead-time often varies within an organization. The order lead-time typically starts when the order is received by the vendor and ends when the order leaves their shipping dock. Expected usage: Many parts could have multiple applications across the site and if the Mean Time Between Repair (MTBR) is available, the stocking decision can be made more accurately. Reliability of the vendor: When selecting vendors, consider past vendor performance and issues that could impact their ability to provide the needed parts. The impact on safety, production or environment: Consider the impact on these areas if the part were not available for the equipment repair. Vendor Managed Inventories (VMI): Items in this category are high-use, low-dollar items that can be stocked at a point-of-use location. Adding to the storeroom’s efforts to reduce inventory, the purchasing group can secure parts as they are needed for the repairs, reducing the need to expedite purchase orders for parts or stock large quantities of many items. It costs $150 - $300 to generate and administer the average purchase order from requisition to payment of the invoice. Using the auto-replenishment (Material Resource Planning (MRP)) capabilities of an inventory management system reduces the purchase order cost to $10 to $12 per transaction. If the kitting process is successful, much of the inventory can be ordered as needed, staged for the job and the work executed as scheduled. Kitting provides benefits to many areas of the organization. The maintenance team experiences increased utilization of the maintenance techs. In most organizations the utilization of the maintenance techs is about 25%. With a planned work kitting program the utilization of the maintenance techs will increase because they are not spending time looking for parts to complete the equipment repairs and the jobs are well planned to drive increase utilization of the techs. Key performance metrics that report lagging storeroom performance can shape strategies and action plans to drive long-term continuous improvement. Leading indicators are the mid and long-term performance goals and the strategy to trend the storeroom performance toward the target goals. The strategy should include key activities and process revisions to drive the expected performance. The MRO storeroom is a business within a business. While the maintenance department is its main customer, it serves many areas of the organization. The storeroom’s function is to manage the inventory investment and provide the needed parts and components for equipment repairs and support the objectives and goals of the organization. The common approach to revising the storeroom operation is to rely on new technology to solve all the problems haunting the storeroom. The first step should be to determine where you are now and what barriers prevent you from having a functional storeroom that proactively supports the maintenance efforts. There are usually some very clear and obvious opportunities that haven’t been addressed because there has never been an initiative to solve these problems. If your MRO maintenance storeroom needs a makeover, start as soon as you can so that you can reap the operational and financial benefits. Innovation is driven by a clear understanding of the problem, planning a strategy to facilitate the needed change, identifying key activities to achieve the goals of the strategy, and measuring the performance with lagging and leading indicators. Having a strategy to execute an improvement plan puts a rudder on your storeroom ship. Monitoring the progress of the initiative with key performance metrics will validate your progress and drive the continuous improvement effort.